The World Heart Day falls on Tuesday, September 29th, and across the globe the focus will be on creating healthy heart environments. 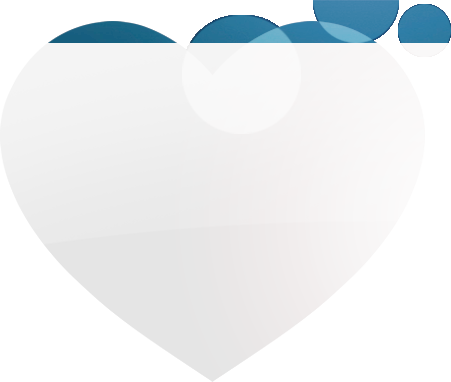 World Heart Day encourages us all to reduce our cardiovascular risk by making healthy heart choices wherever we live, work or play, and to promote a heart-healthy planet for those around us. It encourages us to call upon our governments to facilitate these heart choices. 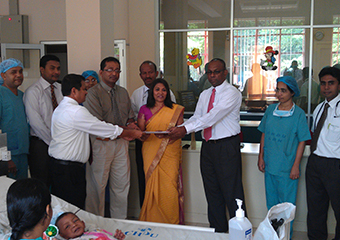 The Government of Sri Lanka, through its work in the cardiac unit of the Lady Ridgeway Hospital (the biggest children's hospital in Asia) is combating congenital heart disease in children. 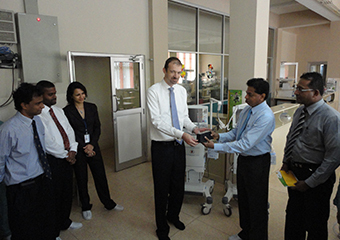 About 3000 children with congenital heart disease are born every year in Sri Lanka and most of them will need either surgical or catheter based treatment within the first year of their life, if they are to see their first birthday and survive to adulthood. If on this World Heart Day, you are moved to help the Government of Sri Lanka help these children and their families do write in to the Children's Heart Project of Sri Lanka on childheartlk@gmail.com and make a contribution that will make difference. "Having partnered with a variety of charitable organisations in the past, the proceeds of this year’s event will be directed towards the Meth Mihira School of Special Education run by the Sisters of Charity, the Children’s Heart Project of Sri Lanka and donations of musical equipment to Kudaligama Central College." 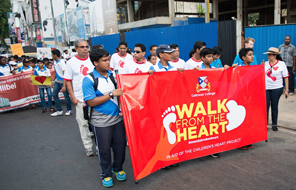 Close to 1500 students of Gateway College, Rajagiriya headed to Lady Ridgeway Hospital on 25th July 2015 to participate in ‘Walk from the Heart.’ The objective was to raise funds to combat children’s heart disease in Sri Lanka. 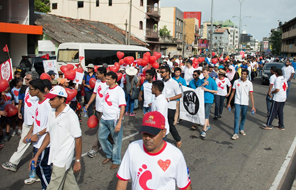 Close to 1500 students of Gateway College, Rajagiriya headed to Lady Ridgeway Hospital on 25th July 2015 to participate in ‘Walk from the Heart.’ The objective was to raise funds to combat children’s heart disease in Sri Lanka. So far the students have collected Rs. 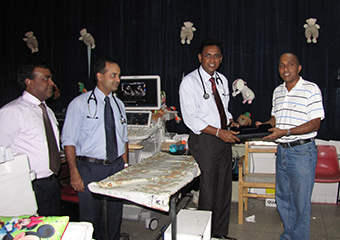 500,000 which was handed over to Dr. Duminda Samarasinghe, Paediatric Cardiologist and Chairman of the Children’s Heart Project of Sri Lanka. 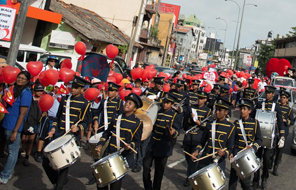 From the Lady Ridgeway Hospital to the College premises, the students walked smartly behind the school band and a large float with a big red heart. They captured the interest of the onlookers as they carried colourful banners and walked, whilst some others rode in the open double decker bus and an old fashioned bullock cart. 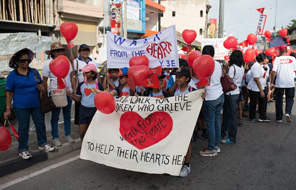 It was heartwarming to see even the younger students being a part of this event carrying heart shaped balloons and wearing ‘Walk from the Heart’ tee shirts. 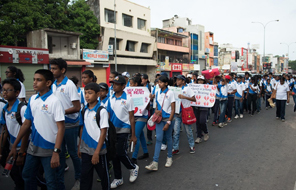 The walk concluded at the College grounds with plenty of food stalls and fun games organised by the Gateway College societies for the walkers, parents and well wishers. Amidst the fun, 45 children between the ages of six and eighteen pledged their support to this cause by committing to donate their Birthdays celebration monies. The Children’s Heart Project is thankful to the students, teachers and management of Gateway College for the support extended by organising such an excellent event. 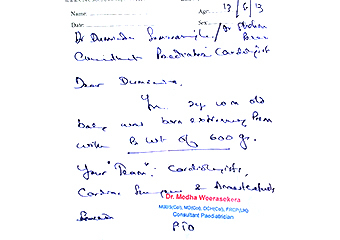 Congenital heart disease is a major killer in children under five years of age. For every 1000 newborn babies, 6-8 are born with a congenital heart disease. 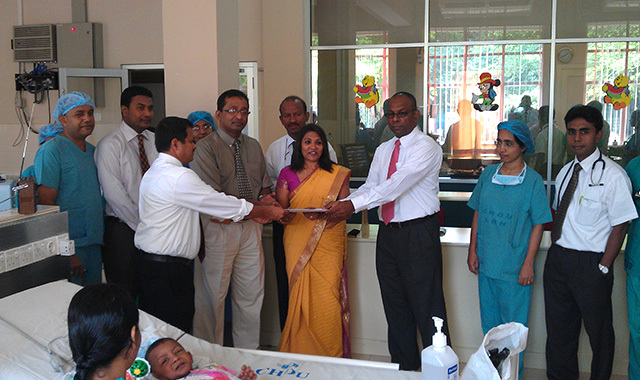 It is estimated that 2,500-3,000 children are born with a congenital heart disease every year in Sri Lanka. 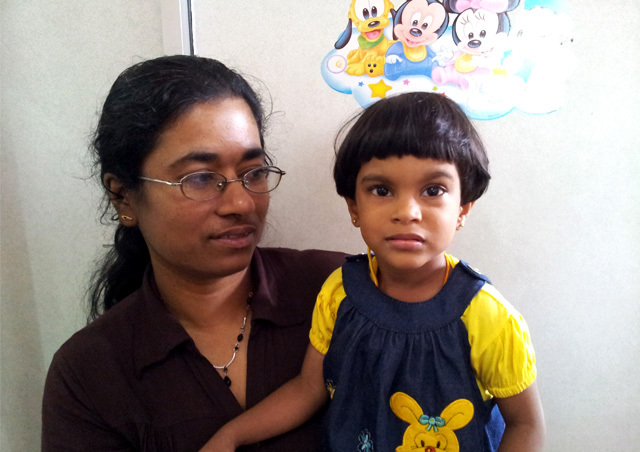 Most of them will need either surgical or catheter based treatment within the first year of their life. Unless treated in a timely manner some of them will not live to see their first birthday and a majority will die before they reach adulthood. 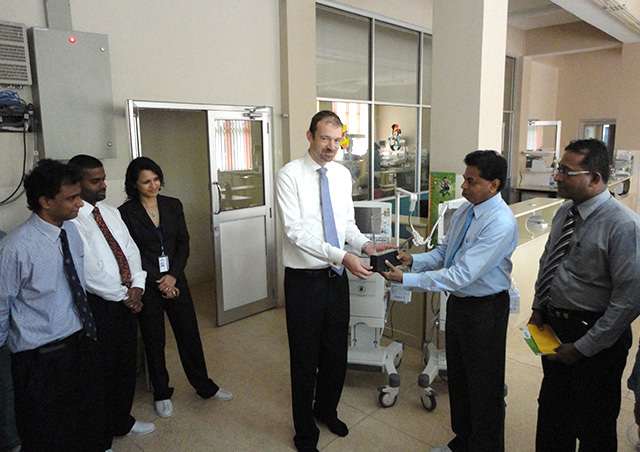 Treatment of heart diseases in children should be performed in highly specialised centres and currently only a very few government and private sector hospitals are equipped to perform such surgeries in Sri Lanka. 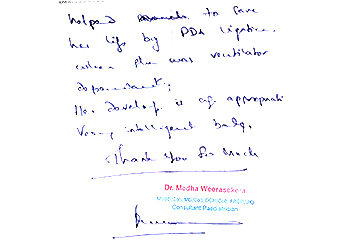 Such a procedure generally costs approximately Rs. 400,000 - 700,000 in private sector but is done totally free of charge in government hospitals. 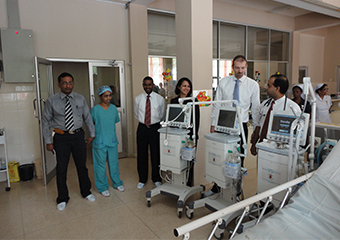 Currently, more than 90% of children with congenital and acquired heart diseases in Sri Lanka are treated at the Lady Ridgeway Hospital for Children (LRH) located within the country's capital, Colombo. 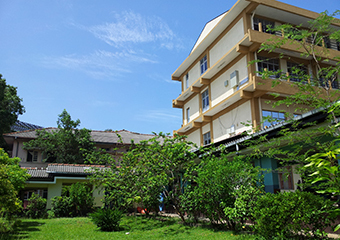 It is a tertiary care children's hospital and all services are afforded free of charge in keeping with the "free state health care" policy of the Sri Lankan Government. 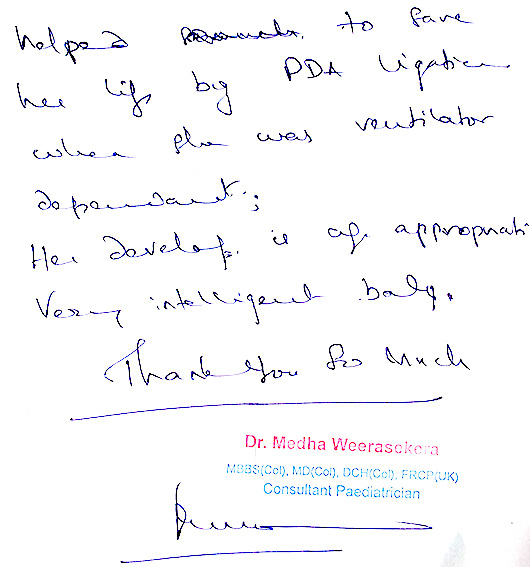 The cardiac program at LRH was initiated in 2007 and has expanded rapidly over past few years. 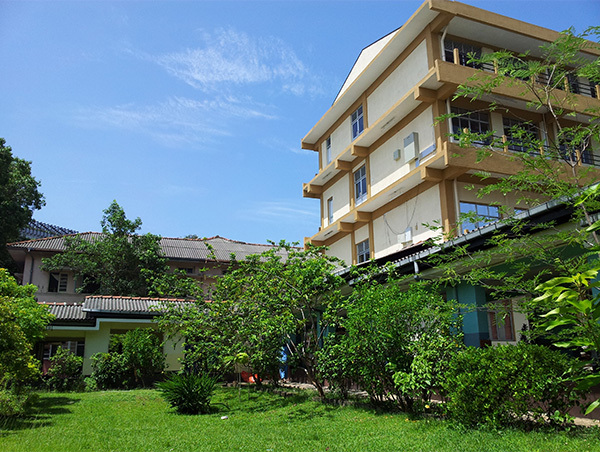 Currently, they perform approximately 650 catheter based interventions and 900 cardiac surgeries every year. However, this is not adequate to clear the long waiting list as there are thousands of children awaiting surgery. 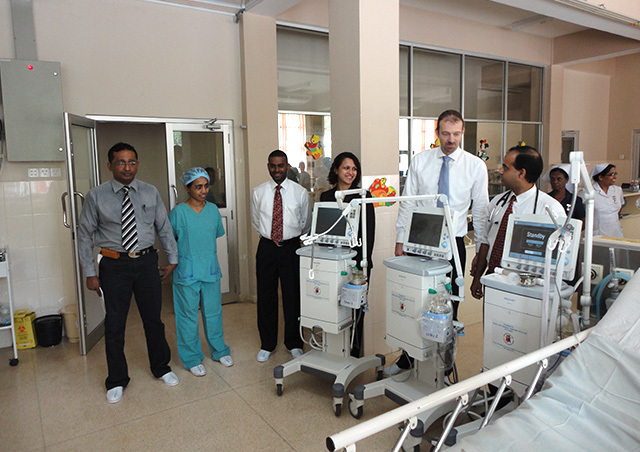 At the Children's Heart Project, we are working to help save Sri Lankan children with heart diseases. 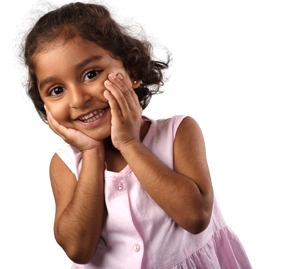 Our aim is to increase the number of successful children's heart operations performed annually and ultimately to eliminate the long waiting list. We do this primarily by supporting the cardiac program at the Lady Ridgeway Hospital not only because it is the only tertiary care referral centre for such children in Sri Lanka but also because they provide treatment totally free of charge. In our effort to support this program, we have provided financial support to complete construction and to refurbish certain areas of the cardiac complex, to purchase certain equipment and consumables whenever it is needed. 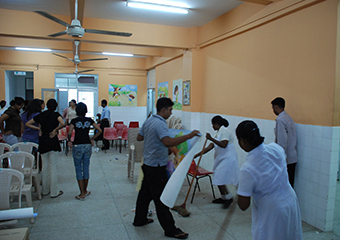 In the interim we have also provided financial assistance to a limited number of children requiring urgent interventions and having to seek private sector facilities in Sri Lanka. Unfortunately we have not reached our target yet and there are many children who succumb to their heart disease even at this moment. 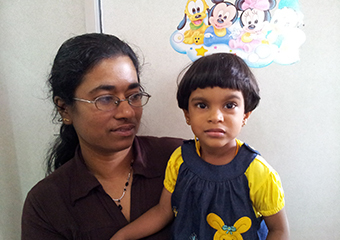 Our goal is to provide timely and appropriate treatment to all children with heart diseases in Sri Lanka without making them an added burden to the family. 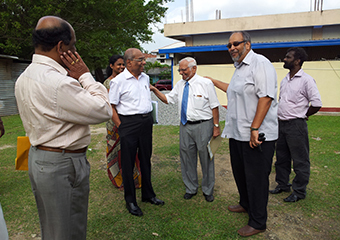 All what we have done, was done with the support and goodwill of generous donors like you. Thank you for donating to the Children’s Heart Project. Your generosity has saved precious lives. 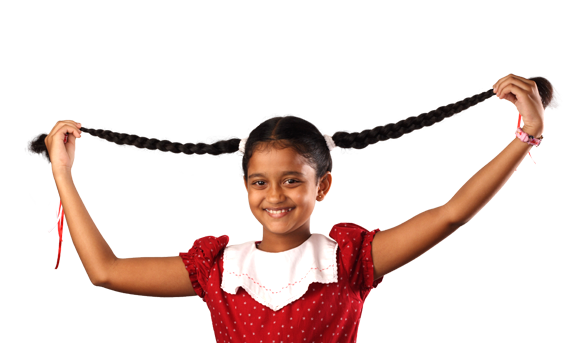 Join us to fight childhood heart disease in Sri Lanka. More than 3000 children need your support annually. You can be a part of this worthy cause to keep a child’s heart beating...today. 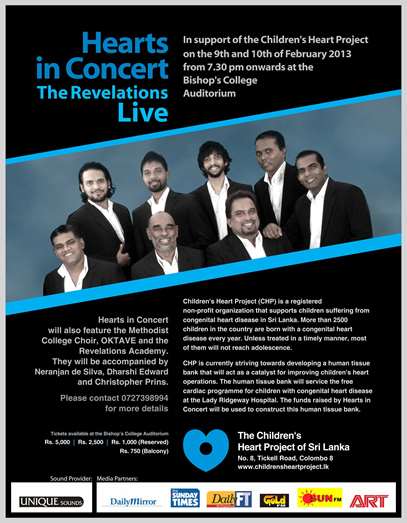 The globally acclaimed choral group in Sri Lanka, "The Revelations", in partnership with Children's Heart Project, presents "Hearts in Concert" to be held on the 9th and 10th of February 2013 at the Bishop's College Auditorium. 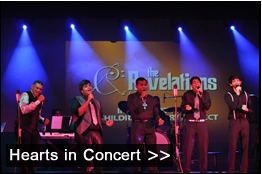 Hearts in Concert will also feature the Methodist College Choir, OKTAVE and the Revelations Academy. 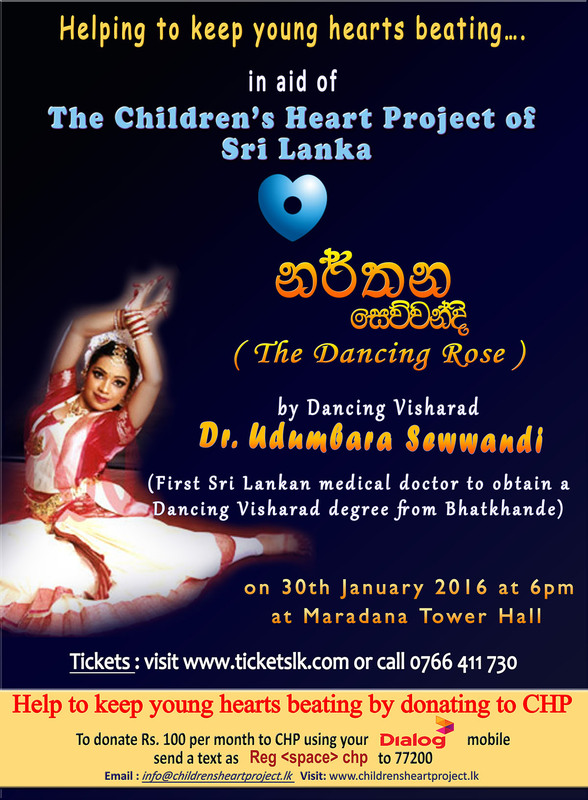 They will be accompanied by Neranjan de Silva, Dharshi Edward and Christopher Prins. 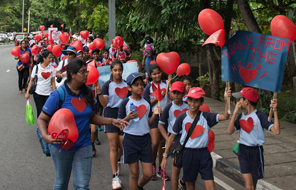 Children's Heart Project (CHP) is a registered non-profit organisation that supports children suffering from congenital heart disease in Sri Lanka. 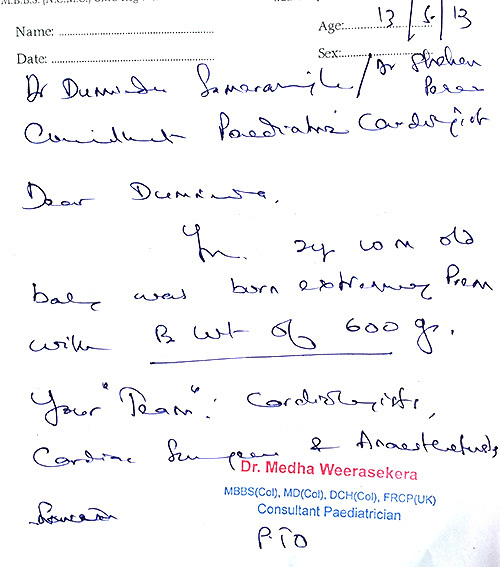 More than 2500 children in the country are born with a congenital heart disease every year. Unless treated in a timely manner, most of them will not reach adolescence. CHP is currently striving towards developing a human tissue bank that will act as a catalyst for improving children's heart operations. The human tissue bank will service the free cardiac programme for children with congenital heart disease at the Lady Ridgeway Hospital. 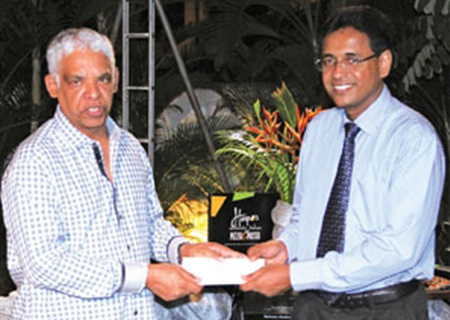 The funds raised by Hearts in Concert will be used to construct this human tissue bank. 15, Boyd Place, Colombo 03.
prior to picking up tickets here. 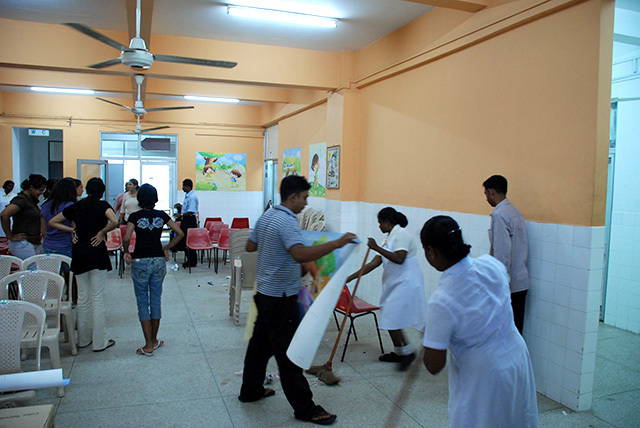 © Children's Heart Project Sri Lanka. All Rights Reserved. Solution by Affno.